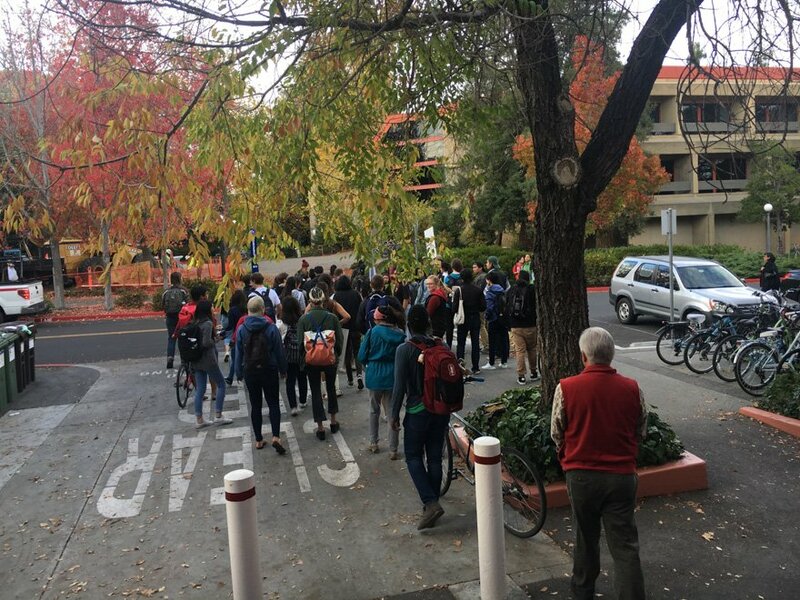 Last fall, students marched in support of renaming campus locations named for Junipero Serra (ALEX TSAI/The Stanford Daily). The committee has been asked to finish its work by the end of winter quarter, after which a second committee will be appointed to consider the renaming of buildings and sites bearing the name of Junipero Serra, a Spanish colonizer and Catholic missionary now controversial for his and the mission system’s treatment of Native Americans. “This [first] committee is not being asked to address Stanford-specific issues but rather to develop guidelines or principles or criteria that some subsequent committee could use,” Brest explained. The two committees are replacing the Advisory Committee on the Use of Historical Names on Campus, which was formed in early 2016 and disbanded last November after it failed to form a recommendation on the issue of buildings named after Junipero Serra. ASSU President Justice Tention-Palmer ’18, who was involved in recommending potential student representatives to the first committee, said he hopes the distinction between the two committees will help avoid another stalemate. “I think what would be most encouraging from this group is to reach some sort of consensus which wasn’t able to be done by the other group,” Tention-Palmer said. Tention-Palmer also emphasized that he believes there should be no conflict within the group once it make its recommendation. Adding that he hopes the committee will be able to come to a decision within the expedited time frame, Tention-Palmer said features of the new committee that will make a standoff outcome less likely. As guidance for the new committee, Tessier-Lavigne included various reports related to renaming that have been produced by similar groups at other universities, including the Working Group on Slavery, Memory and Reconciliation at Georgetown University and the Committee to Establish Principles on Renaming at Yale University. “While every university has its own unique culture, major research universities have a lot in common, so I think our committee will learn a lot [from the reports],” Brest said. Yale University’s committee was charged with outlining a set of principles to guide renaming decisions while simultaneously proposing potential changes to the names of buildings such as – but not limited to – Calhoun College, named after former vice president and vocal slavery advocate John C. Calhoun. Witt also expressed his optimism regarding the potential of the Stanford committee. In addition to Brest, five faculty members will serve on the committee: Leon Sloss Jr. Memorial Professor and Professor Emeritus of History Albert Camarillo, Kenneth and Harle Montgomery Professor of Public Law Pam Karlan, Professor of Philosophy Krista Lawlor, Coe Professor of History and American Studies and Professor of Political Science Jack Rakove and Professor of Poverty and Equality in Education Sean Reardon, who is also a senior fellow at the Stanford Institute for Economic Policy Research. University trustee LaTonia Karr, Vice President for Alumni Affairs Howard Wolf and two currently unnamed ASSU representatives will also serve on the committee along with the faculty members. Contact Claire Dinshaw at cdinshaw ‘at’ stanford.edu. Although currently undeclared, Claire Dinshaw is currently exploring a major in the areas of economics and political science. Dinshaw is specifically interested in political issues related to income inequality, criminal justice reform and women’s rights and hopes to ultimately pursue a career in the area of law or public policy. In addition to her work with The Daily, Dinshaw is involved in Stanford in Government.